When you're in a tight spot where money is concerned, it can feel like you don't know which way to turn. There are lots of options open to you, and just googling something like "fast loan UK no credit check," can bring up so many results that you've no idea where to begin. We can't tell you what your best option is, as only you know what your personal circumstances are. But you can work your way through these steps so that you can be confident you're getting a loan that fits your needs. The first and most important thing is to actually figure out how much money you need... you don't want to apply for a loan and it still not be enough. So, have a clear idea about the amount you need to tide you over, but try not to go above this. The more you ask for, the harder it gets to actually secure any money at all. Then, have a think about how quickly you need the funds in your bank account. Do you need them within the next 48 hours? The next seven days? Or is a bit further in the future OK for you? If it's not very pressing, you might have lots of options open to you, including things like bank loans. On the other hand, if you need cash in a hurry, you'll be better off asking for a loan from a provider like us who can give you money in a really short time frame. Once you've got answers to the two questions above, you can start narrowing down the range of providers that are suitable for your needs. You can get loans from banks and building societies, your mortgage provider, an employer, a family member or an independent company like us, for example. Some of these options might be more appealing than others for lots of reasons. For instance, you might be worried about your credit score so a bank loan isn't suitable, or you might need more money than you want to ask your family member to lend you. Think about what feels right for you. Then, think about what you can offer against a loan - this is something called a 'secured' loan. A secured loan generally means you'll get better terms and conditions on the loan, as the provider has something they can claim to cover their costs if you don't pay the loan back as promised. You could ask a bank to secure a loan against your house, whereas a pawn broker will secure a loan against an item you've bought into the shop. If you opt for a logbook loan with us, we secure your loan against your car. Next, find out what your credit rating is. If you have a good credit rating, you'll be able to apply for a loan at a bank or building society and stand a high chance of getting it. But, if your credit score isn't so great, it's probably not worth looking at banks (unless you want to apply for a 'bad credit' loan). Finally, once you've decided who you're going to approach for a loan and are happy with how quickly they're going to give you the money, check that you can actually afford what you're committing to. You don't want to end up in a weaker financial position. Many will be flexible if you're struggling to make the repayments you promised, but you'll feel better and be in a stronger financial position if you make sure you're only committing to what you can afford to repay. Need to borrow money quickly with no hidden fees and no credit checks? Car Cash Point provide some of the cheapest log book loans on the market by securing loans against your car. 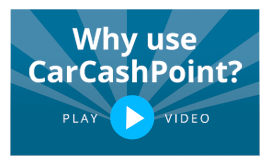 Just submit your car details in the application form for a decision in minutes and cash within one hour if you qualify.